Diabetic retinopathy is an eye disease experienced by those with diabetes. Unmanaged diabetes can cause complications to the blood vessels of the light sensitive tissue in the back of the eye – the retina. Diabetic retinopathy in its early stages may be symptomless and only mild vision impairments may be noticed. This can be confused with aging and is often overlooked. Over time, if left untreated, diabetic retinopathy can result in blindness. When sugar levels are high within the bloodstream it can damage blood vessels. Too much sugar can also cause blockages to the blood vessels in the retina, preventing oxygenated blood from reaching it. The eye attempts to make new blood vessels, but they do not develop properly so they leak. Early diabetic retinopathy: In this form of diabetic retinopathy new blood vessels are not produced. The walls of the blood vessels going to the retina become weak and tiny bulges can begin to protrude. This can cause blood and fluid to leak into the retina. Large blood vessels can also become irregular in diameter, and more blood vessels can become blocked. Nerve fibers in the retina can begin to swell and even the central part of the retina may swell. At this stage treatment is definitely required. Advanced diabetic retinopathy: Damaged blood vessels begin closing off, which causes abnormal blood vessels to grow and fluid to leak and can be a jelly-like substance in the center of the eye. Scar tissue causes the retina to detach from the eye. The new blood vessels block the flow of normal blood, causing pressure behind the eye that leads to nerve damage and can lead to glaucoma. The major risk factor for diabetic retinopathy is having diabetes, and the longer you have had diabetes, the greater your risk of developing diabetic retinopathy. 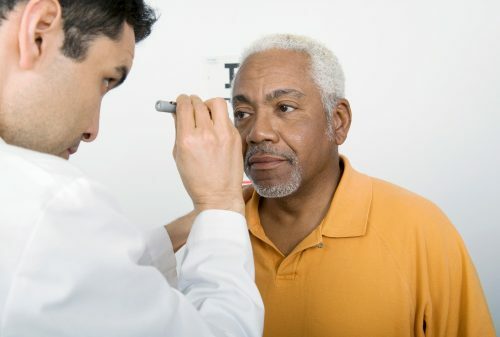 Other risk factors include having poor blood sugar control, high blood pressure, high cholesterol, pregnancy, tobacco use, and being black, Hispanic, or Native American, as diabetic retinopathy is more predominant among these groups. If not well treated or managed, diabetic retinopathy can result in complications including vitreous hemorrhage, which is when new blood vessels bleed into the clear, jelly-like substance of the center of the eye; retinal detachment, where the retina separates from the back of the eye causing changes in vision; glaucoma; and ultimately blindness. A dilated eye exam is the best way to properly diagnose diabetic retinopathy. Drops are put into the patient’s eyes, which dilates the pupil and allows the doctor to have a better view of inside the eye. 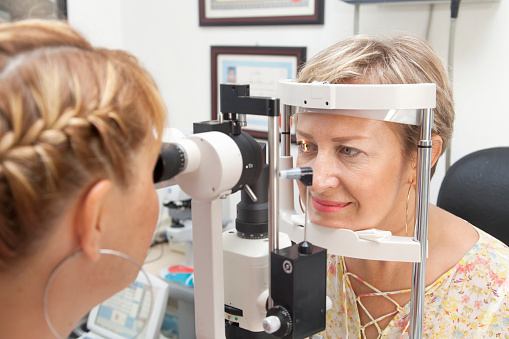 Your doctor will look for abnormal blood vessels, swelling or fatty deposits, growth of new blood vessels or scar tissue, bleeding in the center of the eye, retinal detachment, and abnormalities of the optic nerve. 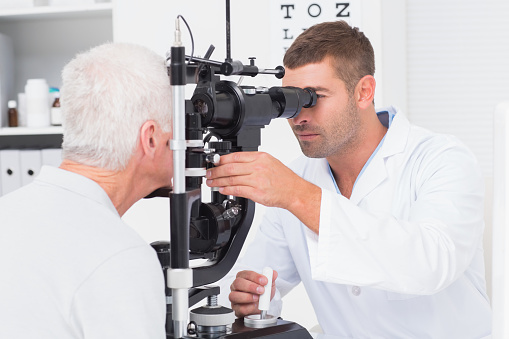 Your doctor may also test your vision, measure your eye pressure, and look for any visible evidence of cataracts. 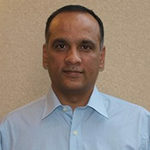 Treatment is dependent on what type of diabetic retinopathy you have as well as how severe it is. In early diabetic retinopathy, treatment may not be done right away, but your doctor will monitor you and determine when treatment is required. 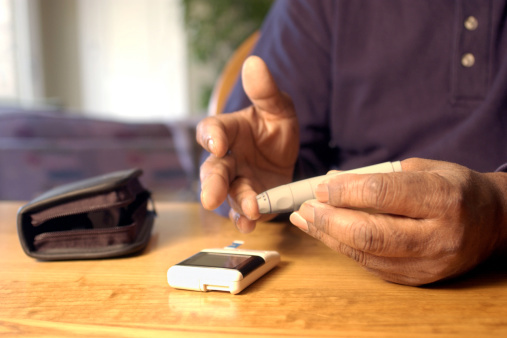 Managing your diabetes at this stage is a good course of treatment to prevent the condition from worsening. In advanced diabetic retinopathy, treatment is required and can be done with focal laser treatment to stop leakage, scatter laser treatment to shrink abnormal blood vessels and vitrectomy, which removes scar tissue and blood from the middle of the eye. If diabetes is still uncontrolled, even surgical procedures will not fix diabetic retinopathy, which is why it is so important to properly manage diabetes. Diabetes does not have to result in vision loss. With proper management you can give your eyes a better chance against diabetic retinopathy.